"I have good days and bad days. On my good days I can almost pass for a normal person, but on my bad days I feel like I can’t find myself." This is actually not a new movie—it was released back in 2014, but I never got the chance to see it even though I really wanted to because I've read the book back in 2011. Then I recently saw this movie available on my flight from Auckland to Singapore, so I decided to watch it. It was a very poignant and beautiful movie. It's heartbreaking, heart-wrenching, and just gave me all the feels. I don't remember much about the details of the book aside from the fact that it's about a woman with Alzheimer's disease. And watching this movie kind of reminded me why I rated the book 5 stars back then. Okay, let's jump right in to my non-spoiling review for the movie adaptation of Still Alice. The story focuses on the life of Dr. Alice Howland; a woman at the age of fifty who has a loving husband, beautiful and successful children, and also an amazing career as a linguistic professor. After several unusual occasions in which she forgets a word and got lost when running around campus, Alice finally decided to go see a neurologist. Through several tests, the doctor finally diagnosed her with early onset familial Alzheimer's disease. And the story follows Alice's struggles in facing the terrible disease that slowly takes away her intelligence and most importantly, her memories. I won't be making any comparison with the book because I barely remember the details. But there's actually not that much plot in the movie, because it just focuses on Alice's condition that gets worse each day and also what she and her family felt about the situation. It might sound boring, however I find myself fully immersed in the movie despite the lack of storyline and abrupt ending. Like I said earlier, it's poignant and beautiful—depressing yet uplifting as well. "I’ve always been so defined by my intellect, my language, my articulation, and now sometimes I can see the words hanging in front of me and I can’t reach them. I don’t know who I am and I don’t know what I’m going to lose next." The best part about this movie for me is the casts. I really admire Julianne Moore's portrayal of Dr. Alice Howland, she totally deserves the Oscar award that she won through this role. At the beginning of the movie, I can just see her intelligence and confidence shining through her eyes. 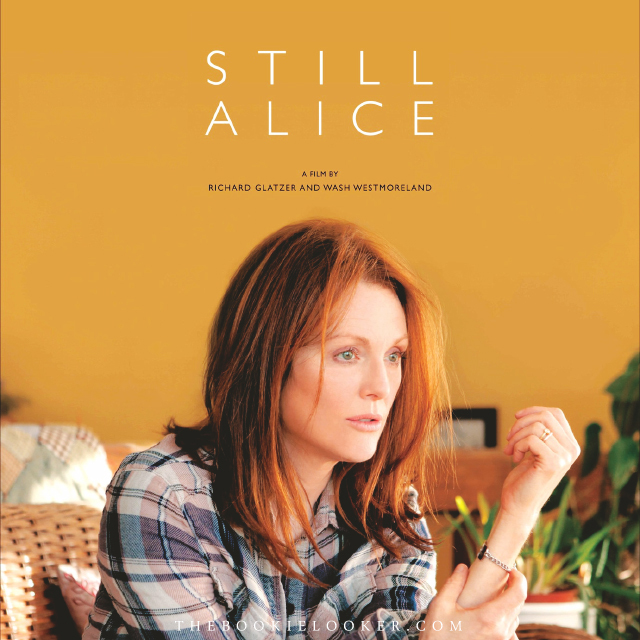 But as the story continues and time passed, Julianne Moore was able to clearly shows how much the Alzheimer's disease has changed Alice as a person. Even though I know it's just fiction, I can't help finding myself feeling sad for Alice as she's starting to lose her memory. It all just seems so realistic to the point that I almost forgot this is a fictional story. Even though Alice Howland is the main focus of the story, the side characters also played a huge part in the movie. Alec Baldwin portrayed Alice's husband, John Howland, who's a physician. I love Alec Baldwin's portrayal of this character and the way he showed how much John loves Alice is just so lovable. The couple have to deal with arguments due to Alice's situation, but throughout everything John has been patient and caring towards his wife. Another important side character is Alice's youngest daughter, Lydia, portrayed by Kristen Stewart. I personally don't like Kristen Stewart's acting in the Twilight saga movies, but I think she did quite a good job in this movie. Not impressive, but good enough. Alice has two more children: Anna (played by Kate Bosworth) and Tom (played by Hunter Parrish), and both of them are gorgeous! "My yesterdays are disappearing, and my tomorrows are uncertain, so what do I live for? I live for each day. I live in the moment. Some tomorrow soon, I’ll forget that I stood before you and gave this speech. But just because I’ll forget it some tomorrow doesn’t mean that I didn’t live every second of it today. I will forget today, but that doesn’t mean that today didn’t matter." "I’m still alive. I know I’m alive. I have people I love dearly. I have things I want to do with my life. I rail against myself for not being able to remember things - but I still have moments in the day of pure happiness and joy."